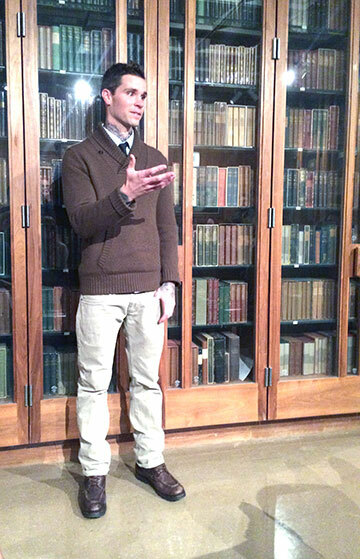 The Center for Primary Research and Training is thrilled to announce that Christian Reed, CFPRT scholar and Ph.D. candidate in English, is this year's recipient of the Center for Research Libraries 2014 Primary Source Award for Research. This is the second time someone from the CFPRT has won a CRL Primary Source Award; the first went to former CFPRT Head, Kelley Bachli, who was nominated by Genie Guerard in 2011. Enlisting the assistance and creative genius of artists and activists, as well as UCLA faculty and students, Christian formed a network of sonneteers that utilized primary source materials in the creation of aqueduct sonnets. The project was executed in three parts: a digital exhibition of sonnets on the Los Angeles Aqueduct Digital Platform, a sonnet reading in Library Special Collections, and a physical exhibition of the sonnets and archival materials that inspired their creation. Christian was not only innovative in the conceptualization of this project and its components, but he continues to be an advocate for creative, scholarly uses of primary source materials. In building his network of artists, writers, and academics for this project, Christian engaged in important outreach work for the access and use of archival materials. His sonnet project was developed diligently as a community-building experience. Many many thanks to everyone who contributed to the success of both the sonnet project and the Los Angeles Digital Platform. And a heartfelt congratulations to Christian!